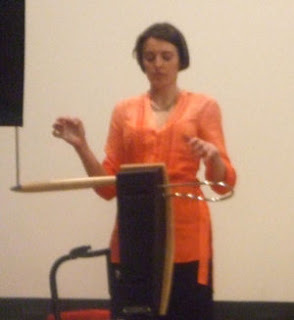 It’s been a long time since I’ve been on stage, and never as a ‘solo’ act, so it was with some trepidation that I set off on the road to Bushey (near Watford) for the ‘Hands Off 2007’ Theremin Symposium. Various people have posted reports of the main event, which was a great success, but of most interest in these pages is the little set I did on the Sunday night for the ‘survivors’ of the whole weekend. This came after a packed weekend of workshops, demonstrations and a truly wonderful concert by a variety of thereminists from around the World, so it could easily have been a total wash-out with everybody drained. I happen to think it all went rather well. I rehearsed a batch of new Lunacy Board songs, along with a couple of old Deserters numbers – just me playing guitar and singing, using an old Linux PC running the ‘Sooper Looper‘ software to set up sections of repeating chords to play solos (either guitar or theremin) over the top of. At some point prior to the event it occurred to me that it would make life a bit easier for me and a bit more interesting for the audience if I was to have some collaborators up on stage, so contacted a group of performers with the offer of the post of ‘Stunt Thereminist’ for The Lunacy Board Subcommittee. I received a couple of positive responses, so re-arranged my setlist to fit around their choices of song, and I was ready to go. Nerves were absent as the performance drew near – probably just because the day had been so busy and I had barely time to think about the evening show. I got the stage more-or-less set up as soon as the main concert had finished, took half an hour to get refreshed, then returned to the stage to finish off. At which point I discovered that I had not brought a video cable for Sooper Looper. It can run quite happily without one, as I control it from a set of effects pedals, but should anything go amiss I would not be able to reset it or see what was wrong. Live and learn. The audience came into the room and chatted as I prepared for the first song. To warm up my fingers and voice I kicked off with ‘Morning Rolls’ – a very short song with no instrumentals or frills. With that complete and with only a small fluffed chord change I invited Wilco Botermans to the stage. Previously in the weekend Wilco had demonstrated his theremin effects set-up which he controls using a specially wired glove to control parameters of a group of Moog ‘Mooger Foogers’, as well as the visually stunning ‘Croix Sonore’ – a unique instrument with similar properties to a theremin. 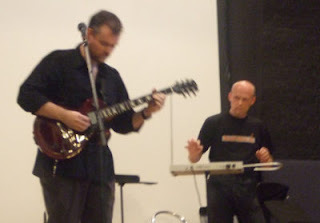 For the purposes of his guest appearance he was using his TVox Tour theremin (the Russian-built instrument favoured by Lydia Kavina and Barbara Bucholz), and the Mooger Foogers, though without the glove controller. We started off with ‘The Unofficial National Anthem’, followed with a very laid-back version of ‘Requiem For A Head In A Field In Butler’ – using Doug’s original bass part which we improvised along to, and finished off with ‘One Night In The Back Of A Fire Engine’ complete with audience participation (cheesy, but fun). Wilco played a mix of melodic accompaniment and weird special effects which worked well – ‘Requiem…’ seemed to really benefit from this approach as far as I can recall. The concert was recorded in full, but I’ve only had a chance to hear a few snippets back. Wilco left the stage and I played another short song – ‘Jim Crow’, then Hypnotique came up onto the stage. We played ‘The Man In The Boat’ followed by Lee Newe’s ‘The Woman In Red’ – both fairly slow songs, to which Hypnotique added some legato cello-like theremin parts. Her solos on ‘The Woman In Red’ were particularly effective at bringing the sad nature of the song to the fore. At some point during the previous song, the looper had stopped responding, so this stopped me doing the new multi-part song we’ve been working on, which needs several looped layers to work, so I called for another stunt thereminist and Terry Bowler came up to play on ‘The Winning Smile’ (a rare love song I wrote last year, which now also incorporates the music from ‘Goodbye Mr. V.’) and ‘The Ballad of Serenity’ (the only cover version I’ve tried, with lyrics which fit into the Lunacy Board remit). I finished off with one more guest thereminist, Captain Ants of ‘The Jaw-Line of Julianne Moore‘, playing the somewhat rockier ‘Fairytale Propaganda’. It was good to finally get some of these songs out on stage, and great to be able to play them with a group of musicians from a range of backgrounds. I hope to get some video clips posted in the near-future from this. Live in Glasgow – next week!